What Are HandBrake Supported Input Output Formats? HandBrake is a good helper to convert videos for free on multi-platform. But the formats supported by HandBrake are limited. Before you using HandBrake to encode videos, you should know whether the source files can be supported and converted to target video formats. So, this post will answer the most talked about question of what are HandBrake supported input output formats. How to Convert Video to All Popular Videos/Devices? 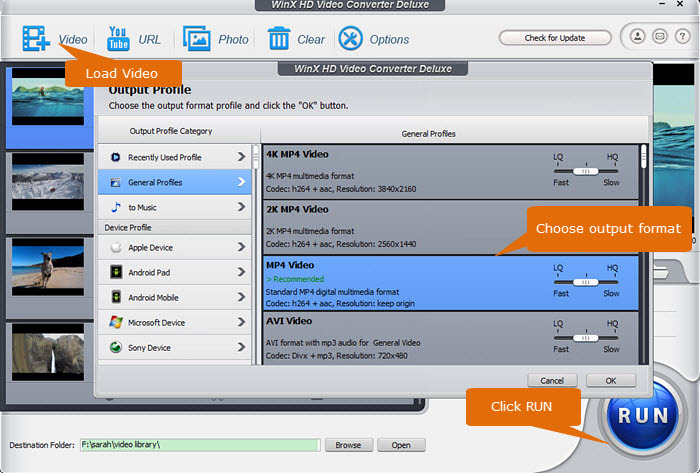 WinX HD Video Converter Deluxe - Best HandBrake alternetive software to convert any videos among all SD/HD/4K/8K videos MP4, MKV, AVI, WMV, AVCHD, MTS, iPhone, iPad, Apple TV, Android, Microsoft, etc. Besides, it can rip DVDs to various formats, download videos and music, record screen and webcam, etc. Why HandBrake cannot read your DVD source or video file? *	The DVD is encrypted. Use a tool to remove copy protection first and try HandBrake again. *	Error happens when you use an app to remove DVD copy protections. *	The source is badly mastered or badly formed, although the source file is playable. You can search for some tools to repair the broken source and try again. Admittedly, HandBrake is free, clean and capable of converting videos/DVDs, chopping black bands around a video, and altering video quality to suit specified file size. However, HandBrake errors are here and there, say, crash in the process, no titles found while scanning DVD, output files are out of order, cannot attach subtitles to a movie, and so on. Here, solutions to fix some HandBrake related issues are provided. How to Solve FAQs Related to HandBrake? Q: What can I do if my video file isn't in a format supported by HandBrake? A: Most video formats are supported by HandBrake, but not excluding some less common formats. If you are in such case, please try a HandBrake alternative named WinX HD Video Converter Deluxe. This video converter supports hundreds of input formats, including HD video (AVCHD, MTS, M2TS, TS, MKV, etc. ), HD-Camcorder video (JVC/Sony/Panasonic/Canon HD camcorder video), regular video (common and uncommon formats like AVI, MPEG, MP4, WMV, RM, ASF, QT, MXF, Vpx8, etc.) and even website video formats (FLV/MP4/WebM SD/HD/4K videos). Its compatible formats are far more than HandBrake supported formats. Q: HandBrake only provides several presets and I'm not good at setting presets on HandBrake. So, is there any video converter which has contained all popular device presets? A: Actually, this need can be addressed by WinX HD Video Converter Deluxe as well. Coming with 420+ preset profiles, it can easily convert videos to Apple iPhone XS (Max)/XR/X/8/7/6S/6/6 Plus/5S, iPad Air 2, iPad mini 4, iPad Pro, Samsung Galaxy S9/Edge, Sony PSP/PS4/Xperia Z5, Microsoft WP9/Zune/Xbox/Surface, Blackberry, Nokia, and other popular devices. Moreover, it is also available to convert videos to M4V, MKV, MPEG, AVI, WMV, FLV, 3GP, TS, H.264, H.265, etc. You can also extract audio from video file in MP3, AAC, AC3, iPhone Ringtone, etc. Meanwhile, it is also adept in free downloading YouTube videos/movies/songs, editing videos, and recording screen and webcam. Q: It is said that VLC is required to remove copy protection when ripping encrypted DVDs with HandBrake. But I always have trouble with it. Is there a tool which can override copy protections and rip DVD-like source as a digital copy at one go? A: Many DVD rippers in the market can remove DVD copy protection and rip DVD at one go. But not all rippers can cope with all copy protections. Some new copy protection schemes make DVD rippers fail to load DVD, select correct title, output digital file or export files in correct order. If you want to rip regular DVDs as well as encrypted DVDs like Moonlight DVD, Frozen DVD, Doctor Strange DVD, Moana DVD, and Sing DVD, WinX DVD Ripper Platinum is your best choice. It is able to bypass all encryption technologies including DVD CSS, region code, RCE, Sony ArccOS, UOPs, and Disney X-project DRM, and rip DVD-like source to mainstream formats and popular devices with ease attributing to its hundreds of output profiles. WinX DVD Ripper Platinum - Rip DVDs (incl. protected DVD) to iPhone, iPad, Apple TV, Samsung, HTC, etc, for personal use.